ROME– Italian Finance Minister Giovanni Tria has come out to reveal that though Europe finds it difficult to understand, its future will highly depend on South, not the North. Tria said this on Friday, December 7 while speaking in Rome at a conference on Africa, challenges and opportunities. “Africa is a continent of great change and opportunities. However, Europe finds it difficult to understand that its future lies in the South and not in the North,” said Tria. According to research, Africa is currently home to five of the world’s fastest growing economies, and only 4 African countries out of 54 will record negative growth in 2018, compared to 8 in previous years. According to Tria, the current narrative about Africa is all wrong. He says, ‘Africa today has 5 distinctive advantages – a huge land mass of 30 million square kilometers, huge resources, a fast-growing population, fewer conflicts and major developments in education, and an economy that has consistently expanded over the last 15 years, even though it still only accounts for 3% of global GDP. 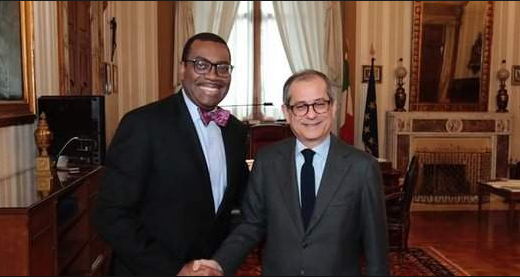 Akinwumi Adesina, the President of the African Development Bank said there is clear evidence of sustained demand growth across the continent. Consumer spending will reach $2.5 trillion by 2030, while business-to-business investments will reach over $3.5 trillion in the same period. “With a growing middle class and rapid urbanisation, consumer demand from a burgeoning middle class will turn the continent into a prime collective investment opportunity that cannot be ignored,” said Akinwumi. “This is proof positive of an Africa in the process of full transformation. Africa is the new international investment frontier,” he added. With $11.6 billion, Italy was the largest European investor on the continent in 2017, and the third largest after China and the United Arab Emirates. Minister Tria commended the African Development Bank for its unique role in fostering a favourable investment environment and addressing Africa’s development challenges. According to Akinwumi, “The migration crisis in Europe is one of the biggest current social and political challenges that Italy and Europe have to deal with. I do not believe that the future of Africa’s youth lies in Europe. Neither does it lie at the bottom of the Mediterranean Sea. The future of Africa’s youth is in Africa helping to grow its economy and employment opportunities”. The evidence for this comes from the tremendous success of the Bank’s new mould-breaking initiative, the Africa Investment Forum, an event dedicated to investment transactions which took place last month in Johannesburg, South Africa. investment interests were secured in deals worth $38.7 billion in three days of transaction-dominated meetings between investors, the private sector and African countries.